When fishing bait for steelhead I prefer dime size egg clusters. Meanwhile, when I get larger, more mature skeins I cure them for springers. Spring Chinook are finicky biters. These plump, juicy eggs that milk out well and emit a strong scent trail increase strikes. With springers combining multiple baits that springers respond to help you catch more fish. 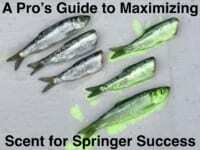 Here’s my favorite springer recipe. A key ingredient is fresh, frozen, whole or filleted sardines. I’m going to use whole frozen sardines and show how to integrate it into your curing process. Start by filleting both sides of each sardine. I do this while the sardine is slightly frozen. Completely thawed sardines can be soft and difficult to fillet. Now filleted, remove the dark blood and entrails. Blood and guts contaminate your cure. Aim for clean fillets like these. When the fillets are cleaned up (and are free of guts, blood and bones) dice them into small pieces. The smaller the better. Now to prep your eggs and get them ready for cure. Remove all blood from the veins. To do this place small relief cuts along the main vein and with the flat side of your scissors push the blood along the vein and absorb it with a paper towel. With your eggs blood free and butterflied lying flat they are ready for the cure. This is a two-part process using BorX O Fire and Fire Brine. I start with BorX O Fire because it helps tighten the lose skeins and make the eggs last longer. I don’t just use the regular cure out of the jar. Springers like sulfites. BorX O Fire has no sulfites, so here is the mixture I create with BorX O Fire as the base. Mix thoroughly. What you don’t use to cure your eggs will fit back into the original jar. Don’t throw it away. Sprinkle on the BorX O Fire cure mix you just made. You can use a generous amount without burning your eggs. This recipe has a small amount of sulfite compared to some of the other sulfite-based cures on the market. Next, sprinkle on the diced up raw sardines. This raw flesh allows the sardine oil to cure into the mix. The curing process also cures the meat. There wont be spoilage. Dump the eggs, sardines and cure into a gallon Ziploc. You can also do this is a tub. If you do, place the eggs into the tub. Then apply the cure and sprinkle on the sardines. Add a cup of Fire Brine. Depending on how many skeins you’re curing I recommend pouring enough brine to submerge the eggs. Keep in mind Fire Brine also aids in tightening the skein. I add a tablespoon of Red Fire Dye to obtain a deep color that springers respond to. Allow the eggs to cure at room temperature for eight to 10 hours. If in a Ziploc gently tumble the eggs a few times during the curing process to ensure the eggs and sardines mix. In a tub (with a glove on) gently stir the eggs. Following the 8-10 hours place the eggs in the refrigerator for 12 hours to complete the curing process. I don’t freeze the eggs in the liquid cure rather strain excess liquid after the curing process is complete. 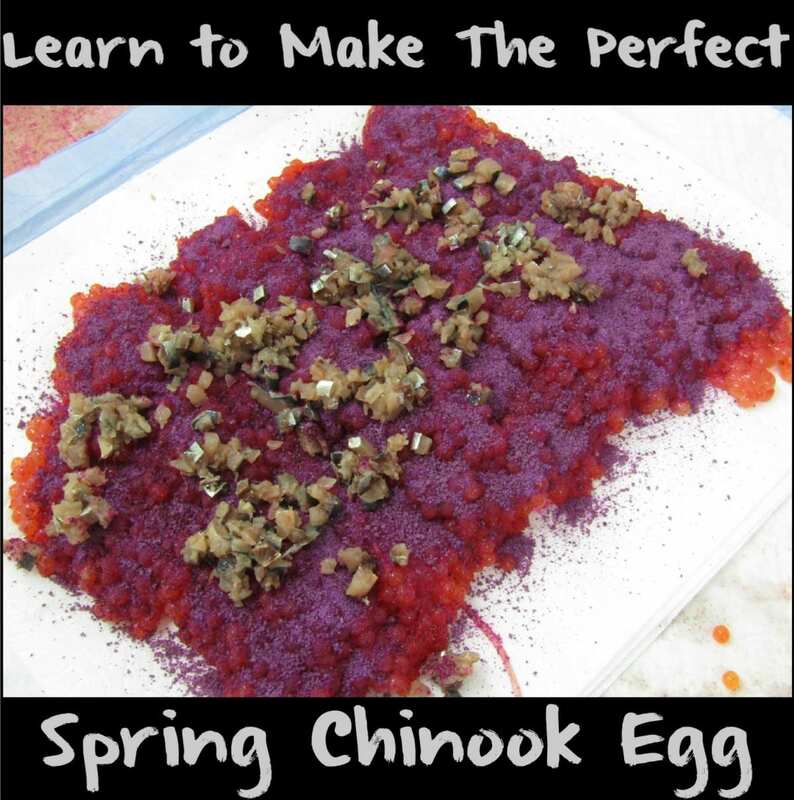 Eggs fish better, hold up longer and milk out more adequately when strained before freezing. Even though the liquid has been drained the eggs are moist, durable and milk out a strong scent. Once strained (which only takes about five minutes per bag) put the eggs into a clean Ziploc for freezing. Roll as much air out of the bag as possible. Then place in the freezer. 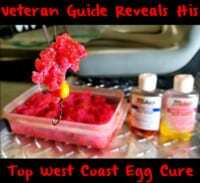 Give the one-two punch sardine/egg cure a try when bobber and egg fishing for spring Chinook. Tip your presentation with a piece of sand shrimp to create the ultimate cocktail. Editor’s Note: Former Northwest Wild Country host Duane Inglin is a fixture in Northwest salmon/steelheading. He continues to spend countless hours in The Bait Lab.